Eid is the time when family get together, celebrating the joyous occasion, eating, catching up with one another, visiting relatives, children dress up in new clothes and so were the adults... its like the Western world celebrating Christmas. Parents faces beamed with happiness, having their children, grandkids back home again. Mere words may not be able to describe their happiness, their joyous feeling...one look at them.... you'll know! ... and it'll not be Eid/ Raya, like the one I used to know. I'd be waking up early on the day, walked to my parents' room, plonked myself on her bed, waiting and watching my mom finishing her morning prayer (I missed watching her...). 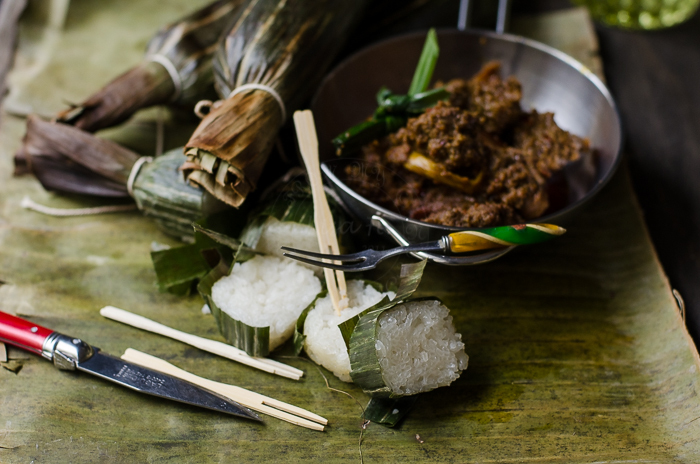 Then we'd busied ourself in the kitchen, heating up rendang, ketupat (triangle shaped glutinous rice), while waiting for my dad to come home from mosque, so we could have breakfast together on the first day of Eid. Imagine the chaotic early morning scene... 27 of us: young and old , trying to get ready!!! One loud voice over another, trying to command and steer their 'ship'... :P.
To me... highlight of Eid has always been in the morning. but early morning, on the first day of Eid, we seek forgiveness from our parents. ... there'll be no mom and dad!!! 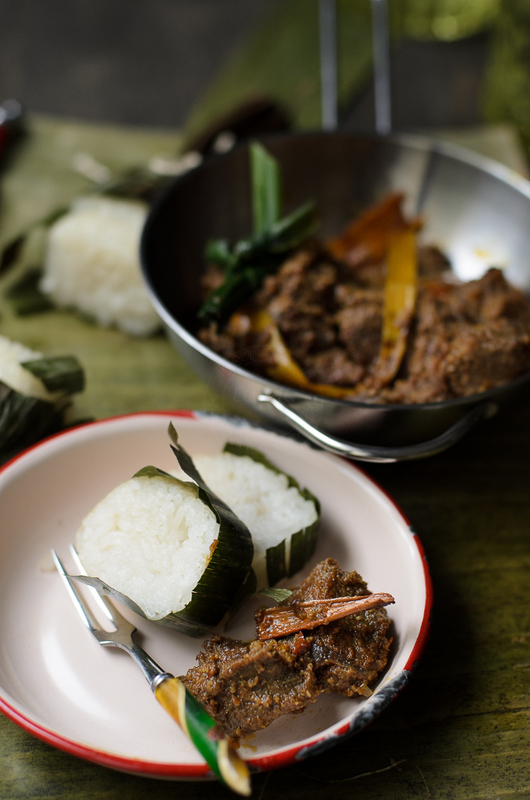 Did I tell you.... that my husband makes the best rendang? 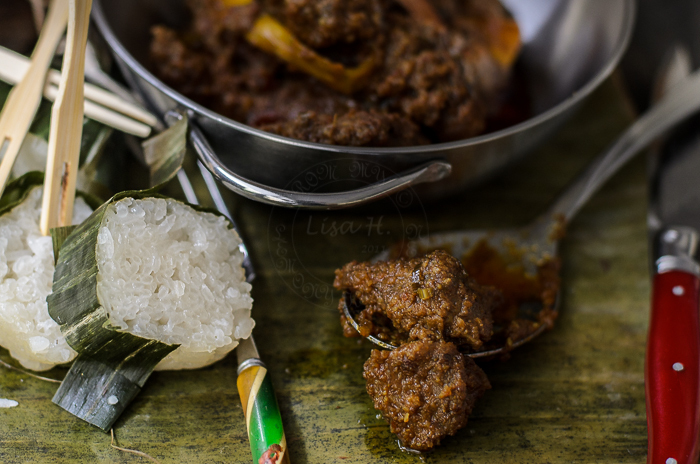 Yes.... he makes awesome rendang :D.
Grind spices : coriander seeds, cumin seeds, fennel seeds and black pepper. Wash and soak tamarind slices (to get rid of gritty sands). Strain. Pan fry (without oil) the desiccated coconut till golden. Leave it to cool and grind to a paste. Heat a big pot / wok ( I prefer wok, its easier to stir), add 1/2 cup canola oil. Add the blended onion mixture, grounded spices and cinnamon stick. Cook and stir until oil splits. 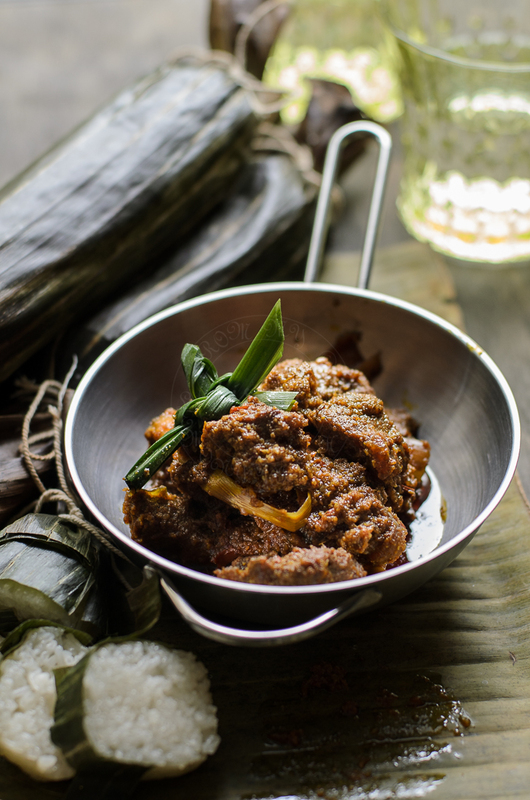 Add gravy beef, tamarind slices, golden fried shallots and coconut milk. Bring to boil, then simmer until beef is tender (approx 40-60 minutes). Add ground desiccated coconut paste and turmeric leaves. Stir occasionally, as to not let the spices burnt at the bottom of the pot. Every time I read about your Eid mornings with your family it brings back so many memories of my own Eids with family. 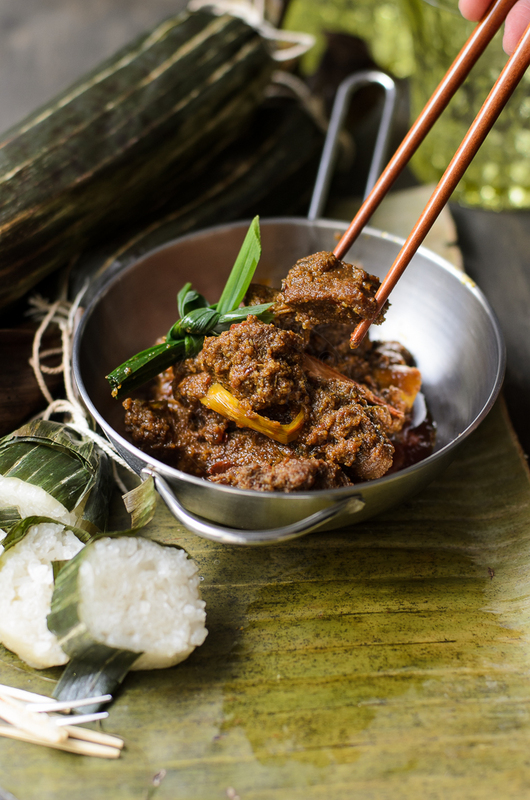 I am going to try this recipe today but have not been able to find pandan leaves, turmeric leaves or sliced tamarind. The beautiful moments that we appreciate more and more as days, years goes by. Ramadan Mubarak and Eid Mubarak to you.